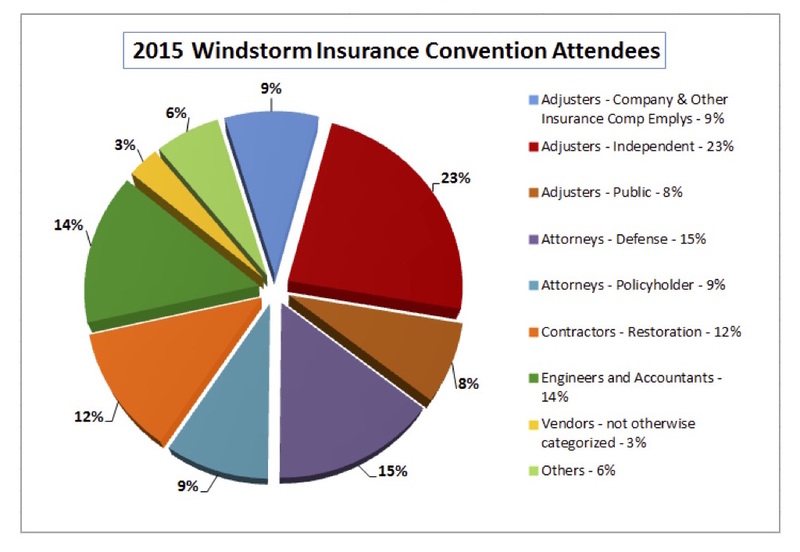 Home Insurance Why Should Insurance Company Adjusters, Attorneys, and Expert Vendors Attend The 2016 Windstorm Insurance Conference? The Windstorm Insurance Conference was founded nearly a decade ago byinsurance defense attorney, Janet Brown. Her law firm biography does not do her justice. She has been nationally recognized as one of the top insurance company litigators for some time. Janet and I have battled in Court over just about everything. She is competent, creative, professional, and a person who quietly knows the weak points of any argument. Fortunately, she had the brilliant idea to start a Windstorm Insurance Network whose membership was inclusive of all trades and professions dealing with windstorm claim issues. There is not another group or association like it in the insurance business. But "simply" answering is not good enough for readers of this blog. You want more reasons to justify to your claims manager or managing partner why this Windstorm Conference is better than spending money on conferences that only have insurance defense attorneys trying to impress you with their knowledge and wit. I am not a rocket scientist about achieving success, but I would suggest if you want to be average, just show up to any conference and learn from what the average views are about anything. Average keeps you in your comfort zone and justifies the views held by the industry average about how to conduct your business. Think about this: Why do the FBI and many major security corporations hire past thieves, con men and hackers to help them better understand their business? That question should never be misconstrued to view policyholders and their representatives as criminals or the enemy. Rather, it highlights the opportunity to learn from different views. Mindsets and techniques of those that are often opposed provide a much greater environment for creative thought and positive change than simply following the same old status quo. So, here is the promise – if you are an insurance company adjuster, attorney or expert, I will share the secret about how you can alter expert reports with zero chance of bad publicity or bad faith if you come to my presentation at the 2016 Windstorm Conference. This is no trick and will be substantive. It will change your Best Practice and will take effort to make certain the procedure is applied properly. I have attended the WIND Conferences for the last 10 years. Aside from the excellent networking opportunities, I have always walked away with a new nugget of information. Your readers may be surprised by the diverse professions that were in attendance at the 2015 WIND Conference. Attorney Janet Brown definitely does justice to the image of defense attorneys of the world; her politeness, competence, and quiet strategy to defeat her opponent is usually delivered with a big smile. I’d also like to say that Ms. Brown was fair and, from my observations, advised the carrier to pay if they should pay, but if a claim shouldn’t be paid or if there were questions that needed answering, she’d dig her heels in and Plaintiff’s counsel/Policyholder should prepare for a battle. I recall the days when she was forming the Windstorm Insurance Network (as if she didn’t have enough on her plate) but her passion for something always persevered. This sounds criminal, however, I’m sure you don’t mean it as such, however, if one is a first time reader of your blog, it sounds unsavory. I’m going to take a stab here and infer that you mean “counter” expert reports w/your own (superior) expert opinions. After all, in some cases it boils down to the battle of the experts and half of that battle is knowing who’s who in that industry. Obviously, a premium paying lay person usually has no idea who’s who and is usually at a distinct disadvantage w/o counsel. If I’m wrong about this, please clarify. WHAT!? How to alter reports? Admittedly, I only read this twice, but I think you need to clarify what you’re suggesting here.